At a time when abortion rights are under attack, California can and must be a leader on abortion access. Support abortion care on university campuses! Right now, most university health centers provide quality health care at low or no cost to students. But campus clinics in the state don’t provide abortion care, and many don’t have an abortion provider close by. For students, it can be hard to raise the money or find transportation. The abortion pill is safe, effective care that can – and should – be offered at every California university health center. That’s why we’re supporting the College Student Right to Access Act (SB 24), a bill introduced by Senator Connie Leyva (D-Chino). 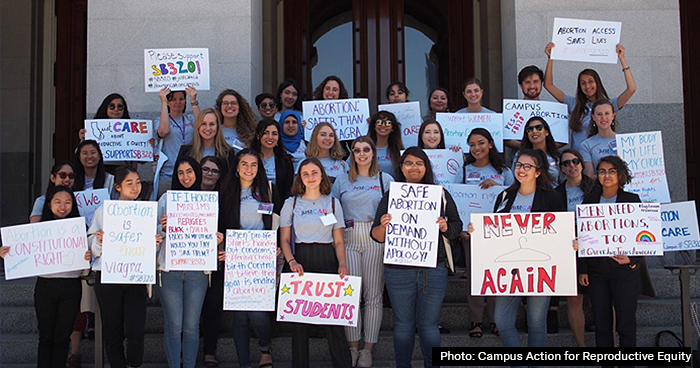 The College Student Right to Access Act will make sure California university students have access to the abortion pill. Join us and ask your state senator to support the bill! I write to you today as a concerned constituent to respectfully request that you support SB 24, a bill introduced by Senator Connie Leyva (D-Chino). SB 24 will increase access to reproductive health services for students attending public universities by providing medication abortions on campus at student health centers. Currently, none of the student health care centers at California’s public universities provide medication abortion services, despite the fact they already provide a range of other reproductive health services (including testing and treatment for sexually transmitted infections, pregnancy tests, pregnancy options counseling, and contraception). Every month, around 500 students at the UC and CSU campuses seek the abortion pill at off-site health care facilities, which creates serious logistical and financial barriers for many students. SB 24 lifts these barriers and provides students with on-campus access to this health care without unnecessary hardship and delay. For all these reasons, I respectfully urge you to vote YES on SB 24.